Perhaps it’s not the Hausel family pictured here, but the pioneering Hansell family: Amos Hansell and his two sons (who the woman is, however, is curious. Amos’ first wife died in 1859. He married again, to his son’s mother-in-law, Caroline Conrad Guthrie, late in age and around 1892. Caroline had had 4 previous husbands and ten children by the time she was 42. She married Amos at age 63. Amos would have been 67 years old at the time of this picture if taken around 1891-2; his sons, Amos and Harry, would have been 34 and 41. The ages and subjects– and Caroline– match up depending when the photo was taken). Amos Hansell was a postmaster at Camp Grant. He established a commercial nursery business with his two sons around 1868-72 that operated for decades. Amos was “well known throughout his part of Humboldt county, and his orchard is one of the finest in the vicinity.” In the picture, our presumed Amos is holding a melon and surrounded by many well kept apple and fruit trees. 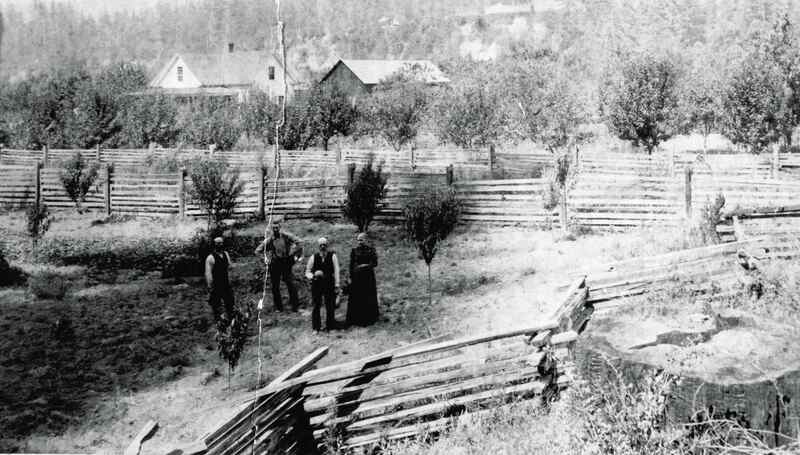 Judging from the pictured location and terrain, apple and fruit trees, the nice residence, well-made fences, subjects, and most likely a prominent and prosperous business warranting an early photograph, this is my best and well-speculated guess. The rough ages of the subjects seem to correlate. The Hansell Family at Camp Grant, and not the Hausel family at Fort Grand, appears to be a more likely possibility making sense– but I can’t prove this and it may be mistaken. Old handwriting, dim memory, and a faulty transcription on a photograph can sometimes lead to these name anomalies, as you know. From what I can determine, we have no record of either Fort Grand or a Hausel family in Humboldt County. Perhaps other readers will have more to say about this most intriguing picture mystery! This entry was posted on Friday, March 16th, 2012 at 6:35 pm and is filed under Historic Buildings, Houses, Indian wars, Interests, Merging Yesterday and Today, old photos, Old Things, People, Random Historical Info. You can follow any responses to this entry through the RSS 2.0 feed. You can leave a response, or trackback from your own site. 21 Responses to Squirrel or a lamp post? First, it is great to have you back at the blog Lynette, we missed you! Second, good work Skippy. I had gone onto the !921 Belcher map and seen a Hansell timber holding across the river from Camp Grant but didn’t have the confidence to guess. Your thorough work nailed it! Good sleuthing. Yes, I’ve settled into my new home and have my books/research with me again. Also feel… anyway, just time to get back into history. Since we have a Hansell thread going, I will add an undated newspaper mention from the RFD(?). Mrs. Auden Paine (nee Louise Read) of South Fork writes…. “my father, F.L. Read, was Amos Hansell’s hired man in 1910, and later purchased the Camp Grant Ranch from Mr. Hansell’s widow. Daddy has told us many stories about his association with Mr. Hansell, and I remember the one about the bugs and the 900 unshaded tomato plants. This last year we had 1,400 in the same field and sold nine tons of fine tomatoes. My Dad planted both the Jonathan and Gravenstein orchards in 1910 for Mr. Hansell. My guess is that she is referring to the flood of ’55. She wrote in response to a Feb 13 article in the RFD about Phillipsville and Camp Grant that must have contained the tomato story she refers to. Doh. Audron Paine was her name, not Audon. excuse me. Ok, I am really thinking that I need to set up a family/genealogy site/subsite. Hansell might be the first family I post…. It would be nice to have a Hansell genealogy website. I am also a descendant of Amos Hansell and feel fairly confident he is a descendant of Peter Hansell who immigrated to Pennsylvania. Amos’ brothers were Lewis and William Evans Hansell. William Evans Hansell died in SF. I found this among my grandfather’s papers, Harry Guthrie Hansell. It really isn’t that hard to set up an independent website/blog. Unfortunately I don’t have the time to do it but you could likely find tutorials and just set up something like this blog-I’m using WordPress. It is free and pretty simple to update. Lynette! Your blog has really taken off the pictures and articles are interesting! Just a footnote, my daughter and her boyfriend went up to your country and camped, looking for family footprints, I guess. He proposed to her up there and she accepted. Rob Hitchcock1772 Hannah CircleSimi Valley, CA 93063h (805) 583-3674c (805) 501-6281 This e-mail contains confidential and/or privileged information. If you are not the intended recipient, you are hereby notified that any disclosure, copying, distribution and/or the taking of any action based upon reliance on the contents of this transmission without previous permission from the originator is strictly forbidden. If you have received this message in error please notify the sender by return e-mail and delete it from your system. Thanks so much for sharing that, Skippy! Thank you, Olmanriver and Sara. Lynette makes it fun. Who doesn’t like a mystery? Amos Hansell was a very prominent fellow in Humboldt history. As a master carpenter, he came to Humboldt County in 1851 to build the Picayune mill, the first sawmill in Humboldt County. He served previously in the Mexican War, and was involved in the Democratic Party around 1858, as reported in Humboldt and Sacramento newspapers. From 1862-3 he served as Captain of the Eureka Rifles and the militia roster shows many prominent citizens serving with him at the time. You may recognize many of the names. That large black walnut tree mentioned above was still alive in 1975, as noted by the Times-Standard’s Andrew Genzoli. Whether or not this picture is of the Hansell family remains to be seen. It’s a good guess. We might know more if we could see the original photograph notation, place the photograph’s location, or if Hansell ancestors could positively identify the subjects. If this is true, then this photograph of Amos Hansell and his family would be a very rare picture of a famous Humboldt pioneer. And it could be the only one known to exist. As a militia member, justice of the peace, and deputy sheriff with ties to both Eureka, Fort Humboldt, and Camp Grant, Amos Hansell was aware of the 1860 Indian Island Massacre and Humboldt’s Indian wars. Did he know of Lucy’s murder, and of the notorious James Brown, as well? Mr. Wes Keat (and also Joe George) photographed the Hansell grave marker at Eureka’s Myrtle Grove Memorial cemetery. It’s a picture (from L to R) of Harry Fox Hansell, next is his son, then his son Harry Guthrie Hansell (for sure! my maternal grandfather), then Amos Hansell (father of Harry Fox and grandfather of Harry Guthrie) and Amos’s wife Caroline Conrad Guthrie. She is not related to these “Harry’s” as she married Amos when he was 67 and but who was also the mother-in-law of another of Amos’s son’s …also a Harry! Confusing? Well, thanks for the additional info!!!! (I have much more family history of the Hansell family from Camp Grant – Ferndale area if interested let me know. My Granddad, Harry Guthrie was one of my favorites! He was a an educator and principal of a junior High school in San Francisco. He loved kids and that is why we have such dfond memories of him when my sisters and I were young. Sure…I can provide you what I have. Some of the pictures are a little crusty, but I treasure them! I have an extensive family history of both my mother and father’s family and have collected many items over the years. My sister, Diane Hitchcock-Owens also has done a lot of family history and I see her website was noted in the blog. Oooops! Her name is Caroline Conrad Hansell… not Guthrie! I have pictures of my Grandad (Harry Guthrie Hansell) teaching the Hoopa Indian children up there. They gave him woven baskets and papooses made of vines and thin pieces of wood. There ‘s a picture of my mother in the papoose frame as a child. I also have a picture of the children in front of a hoisted American flag…less states back then so the stars are pretty big! If you are willing, could you email me some of your photos? I can post them on here with whatever info you’re willing to share. I’m sure lots of folks would love to see them. I also have a scanner and we could always work out a time that works for you for me to scan them. Did you receive the pictures? I just wanted to finish this minor theme and then I’ll post them. I don’t have much history on Amos’s son Amos Jr. Are there any records that you have come across concerning him? I believe that Harry Fox sold his interest in the family business to his brother and then he moved to Hayward, where our story continues. But I don’t know what happened to Amos Jr other than he married Francis (Whitaker) Randle, b. Hazelton, Ill., the daughter of William and Menah (Hurlston) Whitaker of Kentucky. She was the widow of George Randle, Frances was orphaned at a young age and raised by an aunt in Grant County, Wisconsin. My name is Ed Short. My GGGrandfather was a Lewis Hansell (Amos brother). I see several distant cousins on this blog so I just wanted to say hello.